Apart from the botanical research during the 1968-69 Sipaliwini expedition a considerable amount of time was spent on zoological investigations. The herpetology of the area was taken care of by Marinus Hoogmoed (then Leiden University), who joined the Sipaliwini expedition for six weeks. During that time he found a good number of species, some of them new to science. 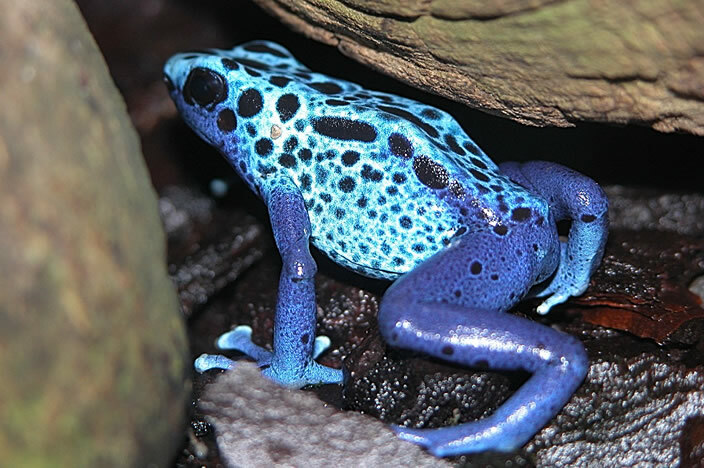 The amazing story of The discovery of the blue poison arrow frog (Dendrobates azureus) (pdf, 1,2 MB) is now published on this site. We hope you will appreciate the thrill of that truly memorable occasion. We have added a scientific paper (1969) by the same author: Notes on the Herpetofauna of Surinam III. A new species of Dendrobates from Surinam (pdf, 2 MB). The open landscape of the Sipaliwini Savanna offers an excellent opportunity to study the prolific birdlife. A Bird Species List (pdf 2.25 MB) is now presented on this site.